Intention is everything. Thought with intention, action with intention, feeling with intention, breathing with intention – intention can be the difference between the meaningful and the meaningless; the thoughtful and the thoughtless. Combine the sound and vibration of drumming with intention. What intention? Answer that question as you allow the vibrational power of live drumming to pave the way to the place you need to go. This is what the DRUMeditation™ experience is all about. Created by Taylor, the DRUMeditation™ is a combination of guided meditation and rhythmic environments in the form of drums, bells, shakers, flutes, voices, etc., by Taylor, resulting in a powerful transformative experience designed to open your mind and body, so that you may identify and be receptive to the internal and external healing you need to do. Imagine this scene: you are lying down in a room, in savasana (in Yoga they call it corpse pose; lying on your back in total relaxation). You are surrounded by other people lying about, all heads pointed toward Taylor. As he gives basic instructions, sets expectations with you and guides you into a relaxed state, the instruments (drums, bells, shakers, flute, voice(s), etc) create a sonic backdrop which will be the magic carpet which will help transport you, while Taylor channels the ancestors. You decide how deep you go; you decide where you go and why; you decide what to do with your experience. Few leave the DRUMeditation™ experience untouched; most leave it profoundly moved. Why would you come to a DRUMeditation™? Thus far, participants have come from a very wide range of places for many different reasons. Some cancer patients, some with emotional issues, some with eating disorders, some with chronic pain, some with energetic blockages, some who just want to bask in the healing power of vibration and rhythm – all and more are served by way of the DRUMeditation™ experience. For more information, visit Dr. Bittman’s website. For booking information, general inquiries or questions, please contact Taylor via email: Taylor@holygoat.com or phone: (773) 909-8633. To see when the next DRUMeditation™ is scheduled, check the Holy Goat Percussion Events page. Taylor (aka Michael Taylor) is a Chicago area percussionist, entrepreneur, educator, recording artist, performer and facilitator, specializing in the West African djembe and dunun drums. He founded his business Holy Goat Percussion in 1995, is the Director of the Tam Tam Mandingue Djembe Academy-Chicago School of Percussion (2006) , a branch of the Tam Tam Mandingue Djembe Academy international schools. He received the TTMDA Instructor certificate, a degree in djembe offered exclusively by Grand Master Drummer Mamady Keita in 2005 and was the first person in the world to take and pass the highest level of TTMDA Senior Instructor in 2006. 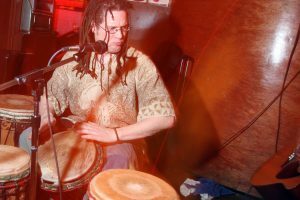 He teaches, performs, imports, sells and repairs drums and does classes and workshops on traditional West African djembe technique, rhythms and songs. Taylor teaches in the Chicago area at Tam Tam Mandingue Djembe Academy-Chicago, the Old Town School of Folk Music, Merit Music, Steckman Studio of Music, Chicago Waldorf School, in the Chicago Public Schools, the Cook County Department of Corrections and privately at his studios in Oak Park. Prices of DRUMeditation varies per venue. Reserve with payment or first come, first serve – these sessions do sell out!!!! PLEASE ARRIVE EARLY! WITH THIS KIND OF SESSION, WE CANNOT LET LATECOMERS IN!!!!! Bring a yoga mat/blanket/pillow – something comfortable to lie down on. Sign up soon, as many DruMeditation sessions sell out way before the date!!!! If a given session is under-enrolled, it may be cancelled 5 days prior to the date. Stay tuned for when and where the next DruMeditation will be…..